1. DINOSAUR STYLE If ordering Dinosaur Style (thru the mail), you can print out this sheet, then circle the price of what you want and mail it in with your payment (a check or money order). 2. ONLINE This page contains a link to a page on my website, stevelevinestamps-plus.com. That page contains brief descriptions of these items, and is connected to my SHOPPING CART which can accept online payments by PAY PAL or CREDIT CARD (VISA, MASTER CARD. or AMERICAN EXPRESS). 3. PHONE IF your order is relatively simple or if you have a few questions, you can phone me at 718-939-5788. For me, "business hours" are flexible. I'm usually in, and if I'm not, you get the answering machine. Leave your Phone#; I'll get back to you. TERMS OF PURCHASE: Items from this list may be combined with items from my other lists for a MINIMUM ORDER of $15. ALL ORDERS will be shipped via Insured or Registered mail, for your protection. Please add $2 for postage and insurance to all orders. Smaller orders will carry private insurance and will have NO USPS markings. There's no "handling" fee; just actual postage expenses. This is for U.S. orders only. Overseas shipments, please e-mail me in advance for shipping information. New York State Residents, please add the appropriate Sales Tax. I sometimes find it hard to believe that it's been 36 years since I decided to specialize in U.S. Postal Stationery. During those years, a lot of material has run through my hands, and it's been one long, massive Treasure Hunt. My "finds" range from the major (I once found 3 of the Long Branch New Jersey Re-Values of 1952 in a $100 junk box lot! ), to the minor (some of which I'm offering this month!) with a whole bunch in between. It's very satisfying to find something which nobody has seen before, but at the same time, I feel a bit disappointed. After all, the item I just found has been sitting out there for 20 -- or 100 -- years, and I may well have handled a bunch of them and never known it, because I didn't know it existed and was never looking for it! What we need is a good EFO catalog, listing not only the major, "known-by-everyone" errors which are Scott-listed, but also listing the lesser-known EFOs (i.e., "flyspecks") which are worth, at most, $4 apiece. The albinos, flyspecks, oil bubbles,, shifts, damaged dies, and yes, even the so-called "favor" items, which don't qualify as "errors", but certainly qualify as "oddities". This would be a great project for the UPSS to undertake. Now, back in the "not-so-good old days", such a project might result in a catalog of 500 pages, with a very necessary cost of $100, and there might actually be 20 people willing to buy it. It would be a money loser and time waster for the UPSS. But today it could be done electronically, and with a cost of, say, only $20-$25, there could be hundreds of people willing to shell out so small an amount to acquire so vast a knowledge of what's out there. This would justify the time necessary to put together the telephone book this would probably be. Anyway, it's an idea! Last mailing, I made a few promises. 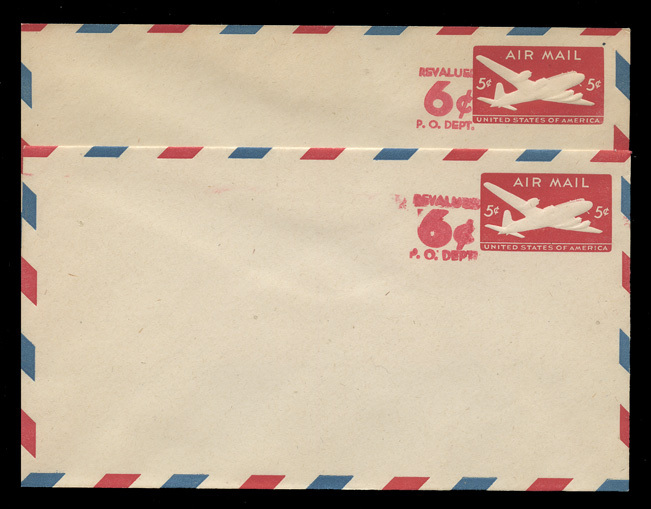 First, I promised to finish my Airmail Stamps listing. This is now done. CLICK HERE TO ACCESS MY "MINT U.S. AIRMAIL" LISTINGS. I also promised to add a section for FOLDED Message=Reply Cards. This is now done. CLICK HERE TO ACCESS MY "REPLY CARDS - FOLDED" SECTION. CLICK HERE TO ACCESS MY "POSTAL CARDS - USED" SECTION. Finally, there's the usual bunch of new items, mostly of the EFO persuasion. Not a lot...but interesting, nonetheless. 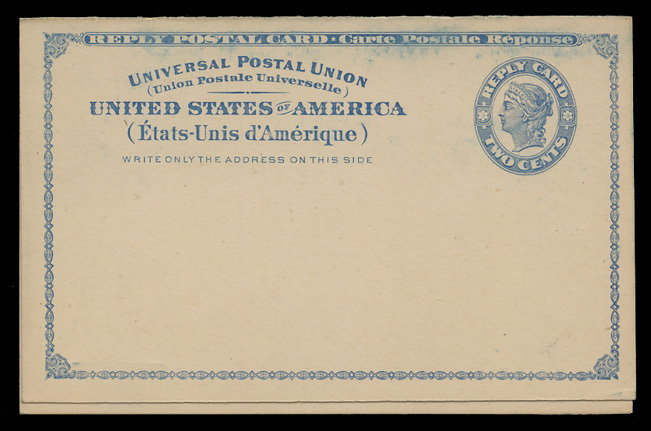 Except for ONE item, i.e., the scarce U562 Envelope with watermark 47, there won't be any new UPSS #s in this month's listings. I'll discuss that at the end. Expanded descriptions of this month's offerings are below, and you can place your order on my shopping cart by using the link below. And now, here's a small group of some REALLY strange Postal Stationery! The story of the Rubber Die varieties of the 1952 Re-Valued Envelopes (UC21 and UC22) is a fairly simple one. It was originally thought that the job could be done using hard rubber dies. And for a brief period of time, it appeared to work. The impressions were as clear as those using steel dies... but you just can't replace steel with rubber, and after a nice run of First Day Covers and a few thousand more mint envelopes, the rubber dies began to break down. They were then replaced with steel dies. The top impressions at the left & right were either made by steel dies, or are early impressions of hard rubber dies. Therein lies a small problem; when you have a clean impression, you really can't tell if it was made by rubber or steel! What you CAN spot from a mile away, however, is a rubber die impression made at the end of the run just before it was replaced. Those "last gasp" impressions have wide lettering, and the worst of them are nearly illegible. Now, SOMETIMES the impressions are heavily inked, as in these scans, and SOMETIMES they have weak, blotchy impressions, but the lettering is wide. I don't believe anyone knows how many UC21 and UC22 envelopes were revalued, much less how many of them were made with the rubber dies! I can only price these based on my experience of 36 years. 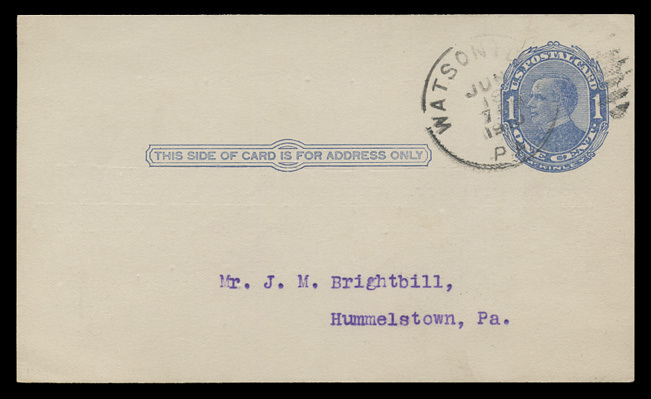 When I began to specialize in Postal Stationery in 1981, I had been lucky enough to purchase a large dealer stock from the estate of Richard Brumbaugh, D.B.A. Paradise Stamp Company. He lived in Washington, D.C., working for the U.S. Dept. of Labor by Day and working as a part-time Stamp Dealer by night. Living in Wasington, he had access to the Philatelic Agency on a daily basis, and very little escaped his notice. Revalues, "Tagged" Issues, and unannounced or unofficial First Days were his specialty. That hoard I bought contained a modest quantity of UC21 (both Steel and Rubber Dies) as well as a bigger quantity of UC22... but only the Steel Dies. Those of you who have been with me since the 1980s know... I've never offered a UC22 Rubber Die in any of my listings...because I never owned even a single copy... until now. Not one lot have I ever purchased which contained these items. Price for a UC22, Size 13, Rubber Die Envelope is $8.50... WHILE THEY LAST! On the one hand, this isn't one of those varieties that jumps out at you... But on the other hand, you don't need Super-eyesight to see it. There's enough of a shade difference in the paper stock to spot it easily enough. The 2 cards scanned at the left are identical in all design respects. Same measurements everywhere; the only difference is the card stock. When held up to a strong light, the cards show the same texture, and when compared in stacks, 25 cards of each are of the exact same thickness. Now... if you look at the UPSS Postal Card Catalog, you'll note something interesting. There is a photo of the "normal" card and one of the "broken line" variety. This is the reason I noticed this in the fist place; I've been looking for these "broken line" cards ever since 2010, when that variety was first listed. So far, I haven't found one. If you look at that scan, you'll see that the "broken line variety" exists on a darker shade of paper. Somehow, that little detail escaped my attention. I guess I didn't see the forest for the trees. I was looking for the broken line, and never noticed the card stock color difference! Anyway...here it is. It's obviously a separate printing, but there are no figures on how many exist. All I can do is tell you that based on my inventory, it's "somewhat scarcer" than the lighter shade. 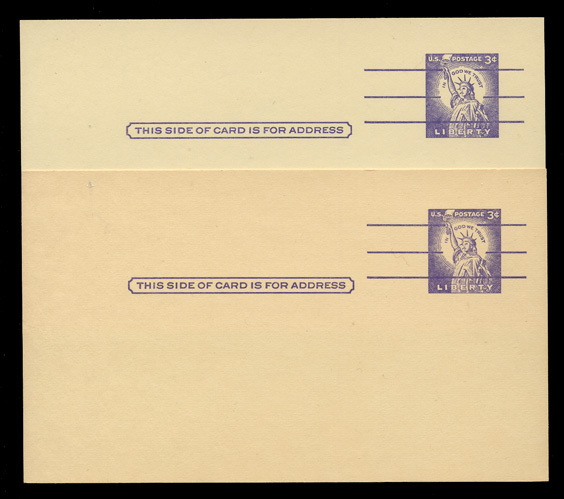 Price for a UX46d, Dark(er) Buff Postal Card is $6.50. These EFOs are the product of some badly worn dies. They are UC18, Size 23, Knife 116, Watermark 45. As you can see in the scan at the right, the worn die at the top is compared to the fresh die at the bottom. I last sold these, maybe 15 years ago, as the "Missing Crossbar in "STATES" variety. Well, it's not really missing; it's just badly worn. Price for a "Worn Die UC18" is $5.00. 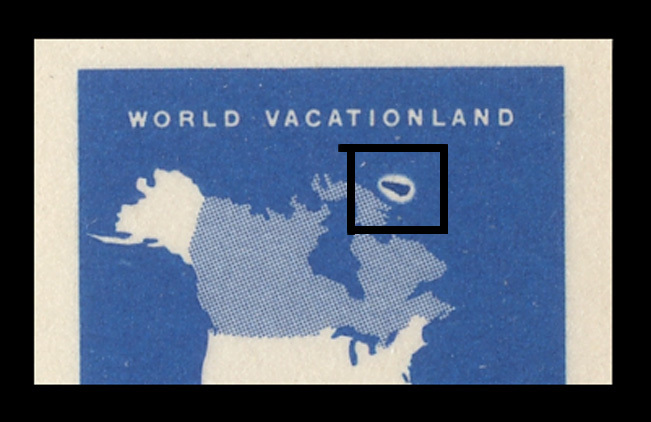 SOMETHING is responsible for those white dots you see in the "A" of USA. It COULD, possibly, be an OIL BUBBLE, similar to the "Flying Saucer" variety which exists on UX44. Or it COULD be some other type of "Foreign Matter", the exact nature of which I don't know. What I DO know is that I have about 15 of these, and they all look exactly the same. I've scanned 4 of them. The cards are unfolded, and in excellent condition, with only a very minor crimp at the bottom. Price for one of these cards is $7.50. 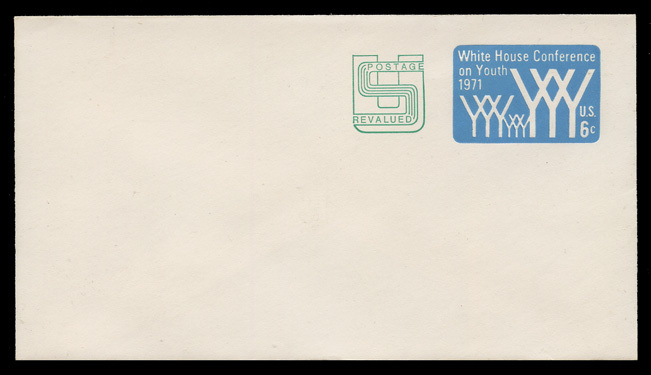 In February, 1971, the USPS issued Scott #U555, the 6c White House Conference on Youth envelope. 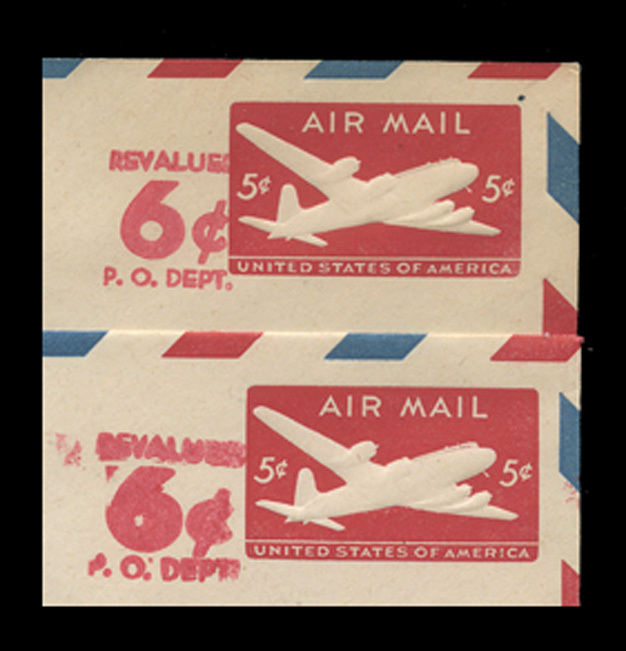 Less than 3 months later, the First Class Postage rate was raised from 6c to 8c, leaving the USPS with a pile of envelopes of the wrong denomination on hand. The obvious solution was to Re-Value the envelopes... which was done. U555 existed with 3 Watermarks; 47, 48A, and 49A. And so wouold SCott U562. AND, just as Watermark 47 was Scarce for the U555, so too did it also become scarce for the U562. I can't say I've never had these in stock, but I can say that I haven't had too many of them in stock, and that they haven't remained in stock for very long. Right now, I'm sitting on about 10 of them, so get them while they're available. 2014 UPSS Envelope Catalog price is $50.00, and they're available at the usual discount. Price for one of these envelopes is $40.00. When "disturbed areas" are round & smooth, or oval & smooth, they are probably oil bubbles, but when they're irregular in shape, they're foreign matter. This one is a small piece of foreign matter. For the record, I have about 20 of these, and they are all exactly the same, which I've tried to show with the row of 5 cards in the left scan. These are not as impressive as my "Island of Atlantis" cards, but they're also not as expensive. That's all for now. But there's a huge pile of envelopes waiting for me in the "back room"... and beyond. Here's a picture. 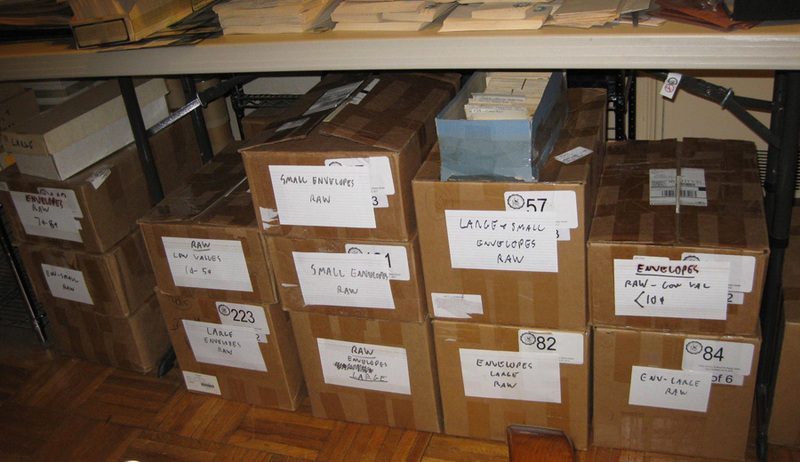 The small boxes have about 3000 #12-#13 envelopes each (give or take a few) and the large ones have about 2400 #21-23 each. There's over 30,000 envelopes here, and a bunch more in another room. Many of them are U522-date, but there's a few thousand U521 and back...plus airs & officials. I'll be working on these AFTER I finish the Used Postal Cards. What's next...well, any time I work on envelopes, you can bet your life there will be some damaged ones, which will yield Cut Squares and Full Corners. It won;t be dull over the next few months. And along the way, there will be plenty of U.S. & Worldwide Stamps, as well as Poster Stamps & other "Cinderella" material. If I don't go blond or crazy, it's going to be a blast. ©2017 Empire State Philateics, Inc.